The State of the Coasts of Guimaras Province, Philippines, was developed to determine the baseline social, economic and environmental conditions and identify priority issues that will be addressed in the Integrated Coastal Management (ICM) Program of Guimaras. The SOC baseline provides the benchmark for determining the impacts of management responses and interventions on the socioeconomic and environmental status of the area. The SOC report may be developed, refined and regularly updated through time to monitor trends and changes that are occurring in the coastal areas of the province, and to refine and adapt policies, management strategies and programs in response to such changes. The report covers the period 2000 to 2009. The report is the output of the combined efforts of different stakeholders of the province, including: the national, provincial, and municipal government agencies; the academe; the private/business sector; the nongovernmental organizations (NGOs) and peoples’ organizations (POs). The data included in the report were validated through a series of field visits to the municipalities. 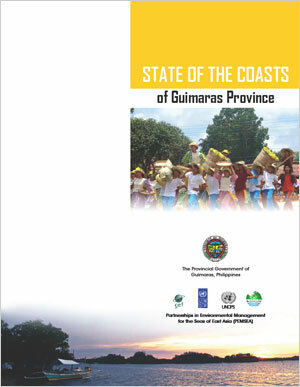 The draft report was presented to the members of the Guimaras SOC Task Team for review and validation on 25 June 2010, the comments and recommendations of which were considered in refining the report. On 14 September 2010, the refined Guimaras SOC Baseline was presented for review, validation and concurrence of the Project Coordinating Committee (PCC).